Masud Olufani, an Atlanta-based artist, actor and writer, starts conversations that can be difficult with his art work. He explores history and the changing use of language through a cultural lens that also brings the present day into contextual focus. Olufani’s exhibition Memory and Meaning opens Feb 7, 2019 in the Haley Gallery at the Albany Museum of Art. It will continue through June 15. “For me it really is a kind of visual exploration and excavation of language and historical events that deal particularly with the African diasporic experience and also have resonance for everybody,” the 2017 Southern Arts Prize State Fellow for Georgia said. 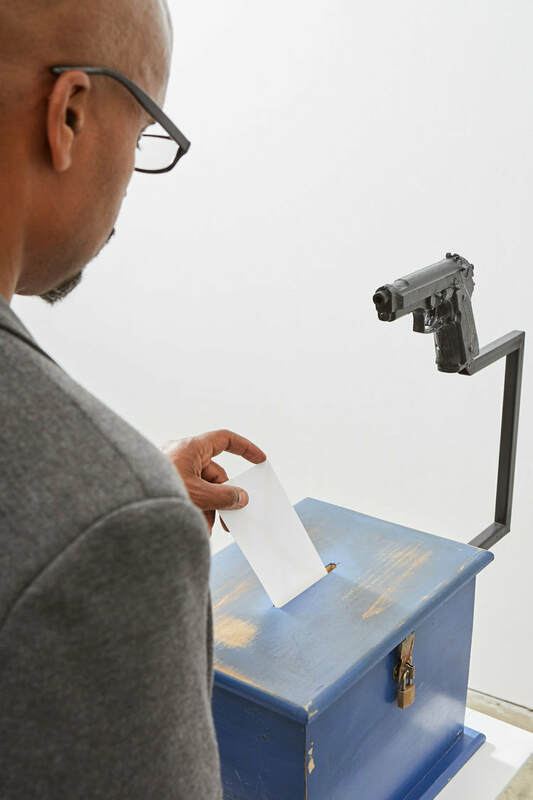 AMA staff had an opportunity in late November to talk with him about his work at a visit his studio at the Atlanta Contemporary Art Center, where he is an artist in residence. 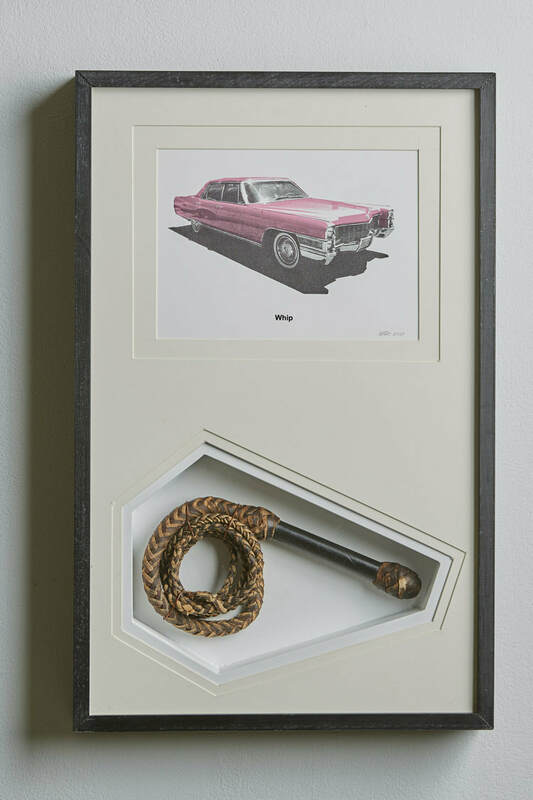 Much of Olufani’s work incorporates images that illustrate the inventive fluidity of black colloquialisms, words and phrases that developed different meanings as decades and centuries passed. Several of his sculptural works also are multimedia, incorporating visual and audio components. He notes that the reaction to his work is complex. At times, it can evoke humor, but also pain. And it leads to a deep contemplation of meaning. In Tight Packers: A Depleted Harvest, Olufani relates today’s prison system to the deadly way enslaved people were transported on slave ships. 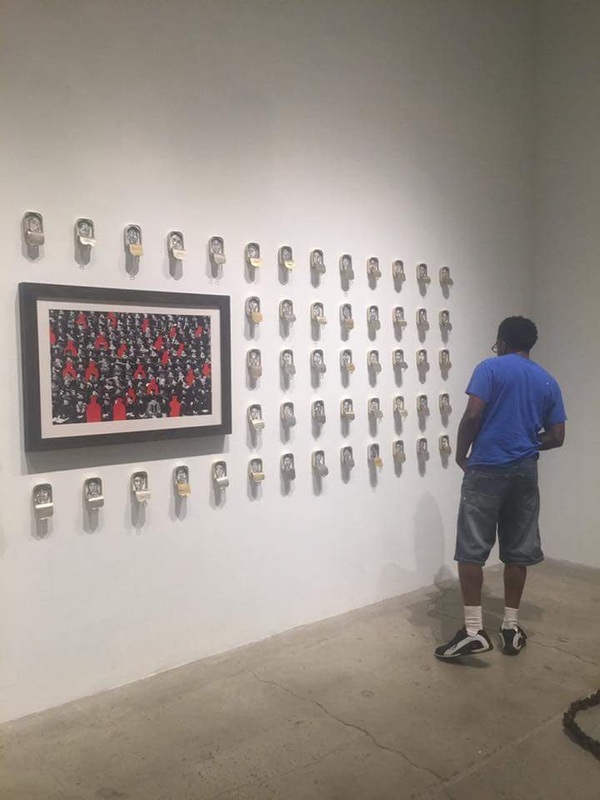 The installation includes images of African-Americans in sardine cans bearing prison I.D. numbers. Those cans surround a graduation photo that has been manipulated to illustrate African Americans who have been lost to imprisonment. A graduate of Arts High School in Newark, N.J., and Morehouse College in Atlanta, Olufani has an MFA in sculpture from Savannah College of Art and Design (SCAD). He has exhibited in Atlanta; New Orleans; Chicago; Richmond, Va.; Lacoste, France, and Hong Kong, China. He is a recipient of a 2018 and 2015 Idea Capital Grant; a Southwest Airlines Art and Social Engagement grant. He has written for Burnaway, Baha'i Teachings and the Jacob Lawrence Struggle Series catalog. He also is creative director of Blocked: A Global Healing Project, an international multimedia performance memorializing spaces marked by the trauma of the trans-Atlantic slave trade. Olufani’s acting career includes a recurring role on the BET series The Quad, and he has appeared in Greenleaf, Being Mary Jane, Devious Maids, Satisfaction and Nashville on TV, and the film biopic All Eyez on Me: The Tupac Shakur Story. Also, he and Celeste Headlee are hosting Retro Report, a Public Broadcasting Service investigative journalism program that re-examines high-profile news stories from the past.